Hey, that tastes good! : salsa, chicken salad, not together. salsa, chicken salad, not together. Since I work in the deli department of Wholefoods, I spend all day serving people mayonnaise-based salads. Chicken salad, egg salad, potato salad, coleslaw, you know. Most mayo is not gluten free. I can't eat any of the mayo salads we serve at work. One day we ran out of mayo and one of the boys in the kitchen made it from eggs, lemon juice, and oil. I can eat that. Since then, I've been thinking about making mayo on my own. The other day I did. We had extra chicken thighs from fried chicken a few nights before, I poached those then cut them up into small pieces, tossed in some diced celery and onion, salt and pepper, and homemade mayo. I made the mayonnaise in the food processor, adding salt and mustard powder and a pinch of chili, then oil, then egg, then oil, then lemon juice, then more oil. It was so easy. I used the "blender mayonnaise" recipe in the newest Joy of Cooking, but like salad dressing, I think as long as you get the proportions right, you can go nuts. 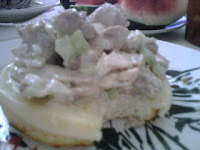 Here's a really ugly picture of my chicken salad (open-faced) sandwich, on a Glutino bagel (they're my favorites). Also, I love Trader Joes spicy, smoky peach salsa but I almost never make it to TJs. It's all the way across the city and I always end up buying more than I can carry on my bike and having a terrible tippy ride home. My local Shop-Rite sells fresh salsa in the refrigerated section and I found Santa Barbara Salsa which says clearly on the label "gluten-free". They make a mango-peach salsa that's pretty good, and a good guacamole. I'm always happy to buy something if it says "gluten-free" on the label! Argo cornstarch also now says gluten-free. Today I'm not working, and I'm going to make dumplings! More on that later.